Designed specifically for helicopters, our next-generation G1000H NXi system takes the industry’s most trusted glass flight deck platform to a new higher level of performance and capability. 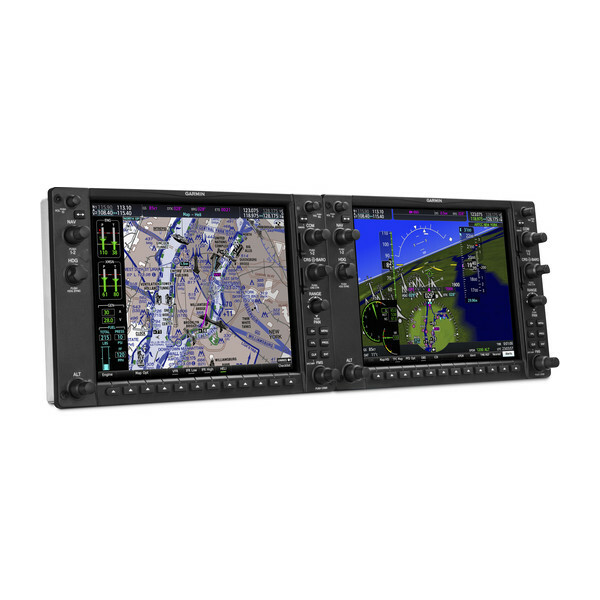 It combines added processing power with brighter, smoother high-resolution displays and new advanced features — offering a clear path for helicopter manufacturers to design, install and certify the “best and brightest” in integrated systems for their products. To highlight the advantages you’ll see from the cockpit, let’s walk through a pilot’s typical first-flight experience with G1000H NXi. From a physical standpoint, the NXi displays look very similar to the earlier-generation G1000H systems. But if you look “under the hood,” you’ll see that the display technology has been significantly upgraded. By going from single-core to dual-core processors, we’ve dramatically boosted the system’s speed, power and capacity for future growth. You can see the difference in the NXi system’s robust graphics rendering and map updating — with its much faster zooming, panning and redrawing speeds. You’ll also note a whole array of new, enhanced operational features and capabilities, including our ADS-B enabled TargetTrend™ and TerminalTraffic™ technoloiges optimized for helicopters plus wireless Connext® cockpit connectivity, HSI mapping on your primary flight display (PFD), animated NEXRAD datalink weather and much more. And with excellent dimming performance from the most modern LED backlighting technology, the displays are bright, crisp and adaptable to a broad range of helicopter models. The G1000H NXi system’s ability to simplify and streamline your piloting workload starts well before liftoff. With the addition of an optional Flight Stream 510 wireless gateway, your G1000H NXi system becomes capable of streaming information in real time between your avionics and compatible mobile devices running the Garmin Pilot™ or ForeFlight Mobile apps. This means you can do advance flight planning on your iPad® mobile digital device or smartphone — and then wirelessly load your flight plan into your avionics once you get to the aircraft. You can also check to see if there are any database updates for your avionics, and simply download those updates on your mobile device. Arriving with your iPad in hand at your helipad or airport ramp, your preflight preparations go quickly. You turn on the master switch, and the NXi displays initialize within seconds — so you can quickly boot up and access your avionics. Then you simply upload all the flight plan waypoints and procedures from your iPad to your avionics. If you have any database updates to load, your wireless Database Concierge connection enabled by Flight Stream 510 can automatically upload and sync those transfers with all your displays while you’re outside doing your preflight walk-around inspection. This app-to-avionics interface really saves you time and tedious data entry — so you can complete your checklist items and be ready for liftoff sooner. As you prepare to call for clearance, you are able to easily select the frequency from the airport information page. The frequency is automatically entered and identified on your PFD. You check your MFD airport diagram for current taxiway and runway traffic. Our expanded G1000H NXi suite of Terminal Safety Solutions includes SafeTaxi® diagrams with TerminalTraffic surveillance of ADS-B equipped aircraft and vehicles operating within the airport environment. Optimized for helicopter operations, the TerminalTraffic display is designed to keep “nuisance” alerts to a minimum — while maintaining pilot awareness of potential traffic conflicts on and above the airport surface. Thus, alerts from nearby fixed-wing aircraft are minimized and abbreviated when your helicopter is hovering or performing other unique maneuvers. To minimize audio interruptions in the cockpit, these tailored alerts are accompanied by an aural “traffic” message when your helicopter is operating below 40 knots and 400’ AGL. With your checklist completed and takeoff clearance received, you’re ready to apply power and quickly get airborne. Once established on climbout, you can really begin to see the benefit of the HSI mapping feature on the G1000H NXi system’s PFD. This enables an MFD-like map view to be displayed right in your primary field of view within the HSI portion of the display in front of you. The detailed graphical landscape helps focus your instrument scan — while allowing you to view mapping, terrain, obstacles, traffic, weather overlays, navaids, airport diagrams and more. Any towers or obstacles that may encroach upon your flight path are color-highlighted and clearly displayed with height-appropriate symbology. And for added visual reference in low-level operations, our WireAware technology overlays power lines on the displays to help you recognize potential wire-strike hazards in proximity to your flight path. In addition to the geographical map overlay within the HSI, our HSVT synthetic vision technology is also optionally available with G1000H NXi. Using sophisticated graphics modeling, this technology recreates a 3-D “virtual reality” database landscape with similar terrain, wires, obstacles, airports and other details displayed on your PFD. Also, there’s a useful projection of the aircraft’s flight path, indicated by a flight path marker on the SVT display, which shows the calculated effect of variables such as attitude, airspeed, wind vectors, etc. on the aircraft’s trajectory across the ground. It’s a valuable tool to have when you’re trying to gauge a possible conflict with terrain or obstacles near your flight path. It’s also very useful in targeting the helipad or runway threshold on approach, particularly when you’re correcting for crosswinds or low-level turbulence. For added hazard avoidance, G1000H NXi supports high-resolution, five-color HTAWS alerting. Using a high-integrity GPS position information, compared with the the system’s internal databases, the HTAWS offers “forward-looking” avoidance capability to predict in advance where potential hazards may exist and help you maintain safe separation from nearby terrain, power lines, towers or obstacles. Accompanying voice alerts also indicate the relative threat level with messages such as “Caution, Obstacle, Obstacle” or “Warning, Terrain, Terrain” — as well as keeping you apprised of your aircraft’s height above ground when descending below 500’. When your mission requires operation in close proximity to known terrain or obstacles, our pilot-selectable reduced protection (RP) mode allows you to minimize alerting interruptions. To help you keep an eye peeled for traffic, the G1000H NXi system supports ADS-B “Out” and “In” functions that include our patented TargetTrend relative motion technology. This offers you a faster, more intuitive way of judging target trajectories and closure rates relative to your aircraft's flight path. For even more capability, G1000H NXi is compatible with a range of active traffic systems². 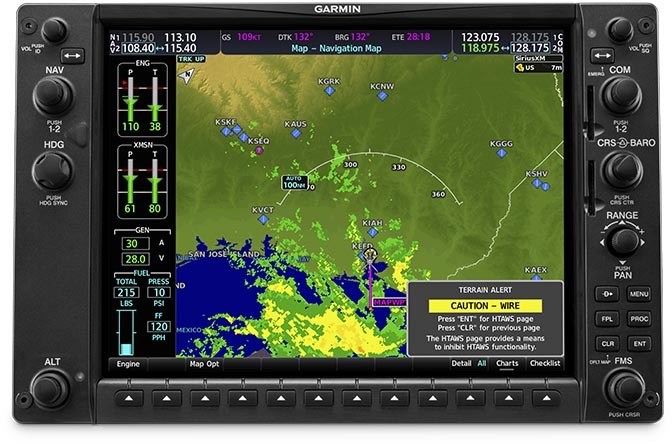 To assure you’re aware of changing weather conditions en route, G1000H NXi supports a variety of datalink options — showing animated NEXRAD imagery, current airport conditions, forecasts, precipitation, lightning, winds and more. Both the ADS-B network and SiriusXM® satellite weather services¹ can be accessed from the system (SiriusXM subscription and optional hardware required). Plus, an optional Connext satellite link receiver can also bring seamless on-demand worldwide weather information to your cockpit for international operations. For tactical onboard weather avoidance, an available Doppler-capable digital radar² puts a wealth of technology at your fingertips. Its full-color storm cell imagery can be overlaid on your MFD’s moving map — as well as on your PFD’s HSI map display. When things get busy in the cockpit and you don’t have an extra hand to spare, you’ll really appreciate the Telligence™ Voice Command¹ feature that’s available on G1000H NXi. When installed with an optional push-to-control switch on the cyclic, you can keep your hands on the controls while using spoken commands to activate certain key audio and radio tuning functions. For example, you can simply press the command button and say “Comm One” to select the radio you want to use. You can also take advantage of split-screen capability on the NXi system’s flight plan page that allows 2 or more separate page views to be displayed simultaneously — so you can access valuable decision-making information at a glance without having to flip through multiple pages. For increased operational capability, the system also supports multiple video input options that enable the MFD to serve as a FLIR or live-cam video monitor. 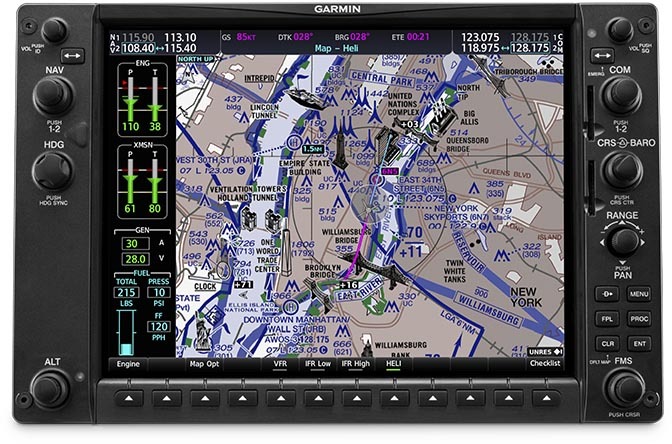 And for on-screen map and chart navigation, the NXi system’s dynamic moving map display on the MFD can also be supplemented with helicopter-specific charts throughout 8 U.S. metropolitan areas, including the Gulf of Mexico and its oil drilling platforms — as well as VFR sectional charts, IFR en route charts, electronic approach plates and previews of standard airport departure and arrival procedures. As you near your destination, the G1000H NXi system works to streamline and simplify your transition into busy terminal airspace. At a glance, the G1000H NXi system gives you a clear picture of your horizontal and vertical flight situation. For added context, a vertical situation display (VSD) on the MFD provides a georeferenced profile view, which looks much like the bottom portion of your approach plate, to show your descent in relation to nearby topography — as well as to your active flight plan. Plus, the NXi series goes even further by adding Visual Approach capability. With this, your system can generate a three-degree vertical flight path down to pilot-selectable minimums. As you continue through the landing procedure, our georeferenced SafeTaxi diagrams help you stay oriented if you’re not familiar with the airport layout. You easily navigate the georeferenced layout of runways and taxiways, drop onto your destination ramp, and begin clicking through your shutdown checklist. Meanwhile, your NXi system’s built-in Flight Data Logging feature is automatically storing all critical flight and engine parameters on an SD™ data card, which your service crew can use to analyze trend information and spot early signs of potential service issues to avoid more costly repairs later. With its extensive features and advanced technology, it’s easy to see why G1000H NXi is the ideal flight deck solution for your helicopter. 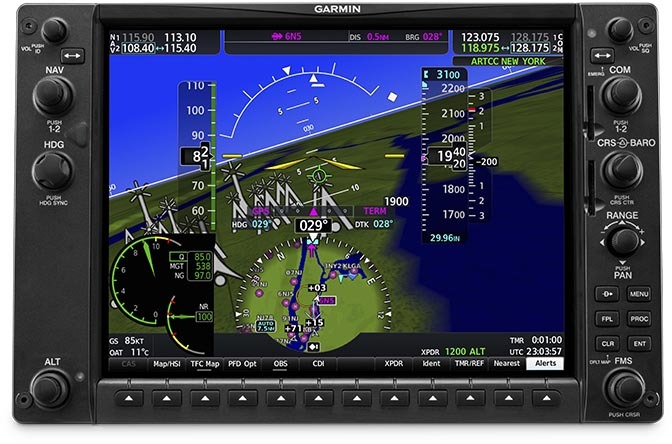 Not only can you count on these growth-oriented displays to keep pace with evolving technology and airspace requirements, but you’ll also gain the peace of mind provided by an industry-leading 2-year warranty (and optional FlightLevel Extended Warranty) on your new system components — all backed by our award-winning Garmin aviation support team.